Our new container of French antique furniture has not yet arrived, but if you love beautiful antiques we’re giving you a sneak peek at the beauties now sailing across the Atlantic Ocean! 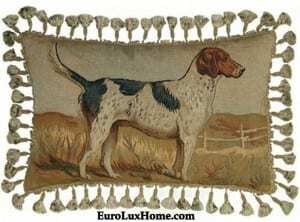 We personally selected these fabulous antiques (read more about our antiques buying trips in Europe here) because we think our customers in the USA will love them. You can see all the new container furniture here. The pieces are available for pre-order now so you can snap them up first. As usual, you will get free shipping in the Continental USA and some parts of Canada. 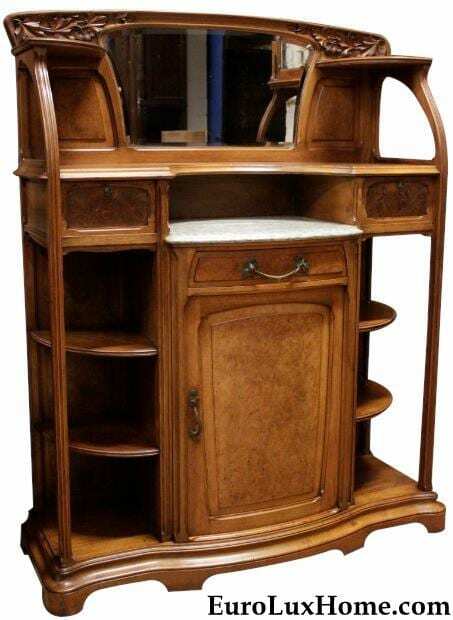 Or why not browse through some of our favorite pieces in this blog post, starting with this gorgeous antique Art Nouveau server or sideboard. 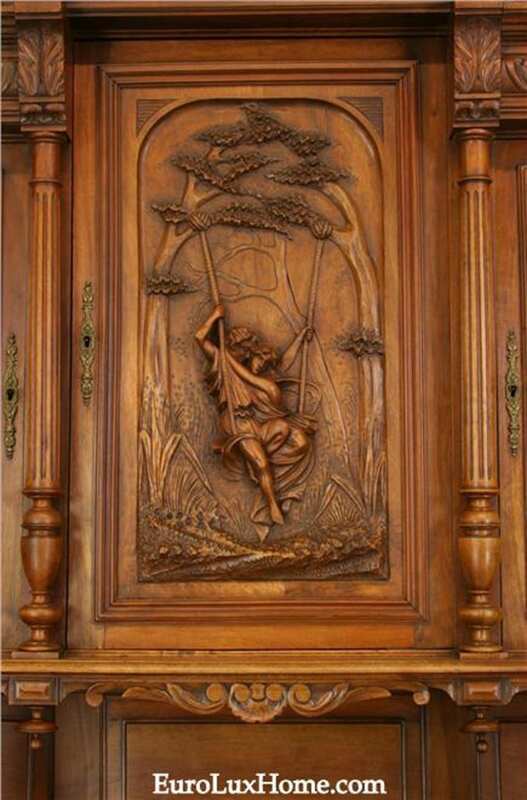 Dating to 1900, the Art Nouveau cabinet is unusual and versatile. It’s perfect as a dining room server, but you could also use it as a home bar or — thanks to the mirror back — even as a vanity in your bedroom. We also have the matching Art Nouveau buffet, table and chairs, if you want a complete set! We are so blown away by this antique French cabinet or buffet with its impressive jester carvings…we almost don’t want to let it go! 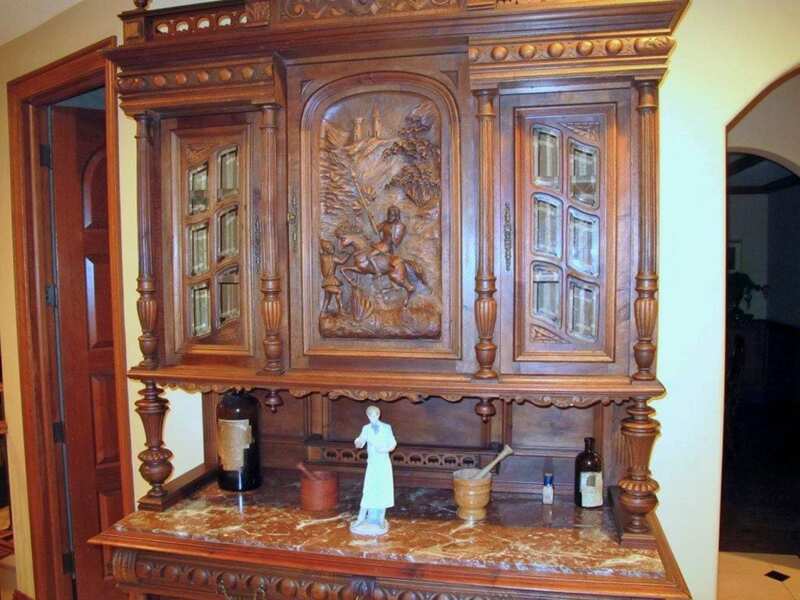 The walnut buffet dates to 1900 and the whimsical carved figure on the top cabinet door looks like a playful jester, while the ornate carvings also include two faces gazing out to keep watch over your family! A red marble counter top provides a handsome space for your serving dishes or cheese board while the plate rack is the perfect place display your favorite platters. This outstanding antique French cabinet or buffet is sure to become a family heirloom. 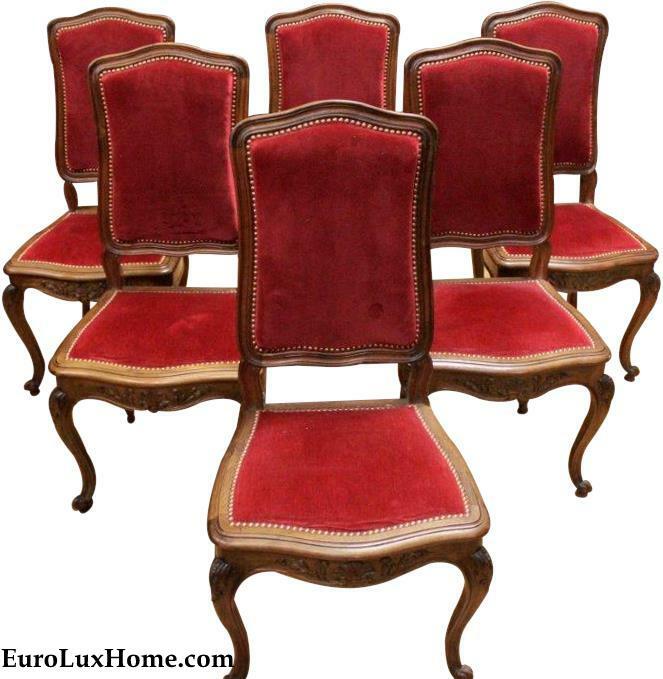 We also have these six vintage French Louis XV Rococo dining chairs with red upholstery on their way to us from France. 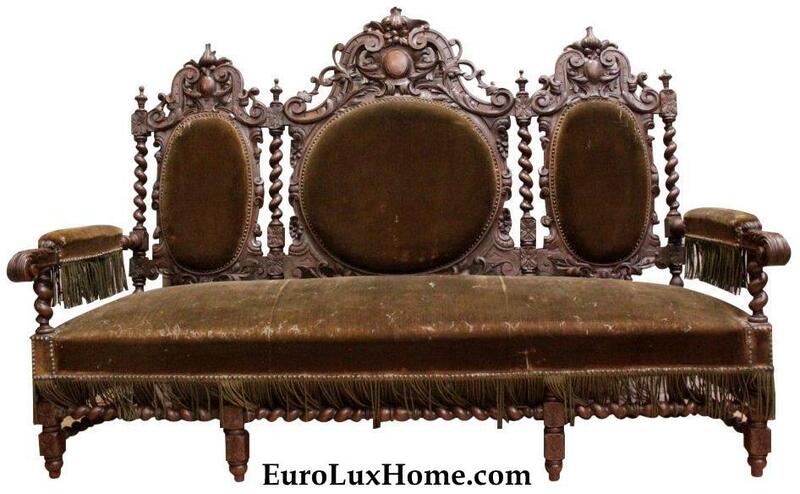 This ornate antique French Hunting style sofa was crafted in oak in about 1880 and it is handsomely carved all over. The antique oak sofa will look incredible in your living room or great room, or imagine it as seating in your large foyer or entryway. Opulently carved flourishes, finials and barley twist posts make this a decadent delight. The upholstery could be updated to suit your own decor, creating a custom look! These are just a few of our favorite things… see all the sneak peak French antiques at this link. We can’t wait for them to arrive! 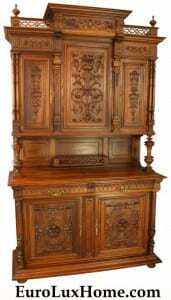 This entry was posted in Antique Furniture and tagged antique cabinet, antique french buffet, antique French furniture, antique Renaissance buffet, Art Nouveau furniture, French Antique Furniture, French Vintage Dining Chairs, Heavily Carved Antique Furniture, Hunting Style, Louis XV, Rococo Style, sofas and settees on March 7, 2019 by admin. In my blog posts New Hobbs Germany Wine-Inspired Furniture and Hobbs Germany Bordeaux Collection: The Story I told you that EuroLuxHome.com is now a U.S. distributor for the cool new Hobbs Germany line of wine-inspired furniture. My video below shows you more about this unique collection, but if you were eyeing up the Hobbs Germany pieces or any antique French furniture or vintage decor or new lighting in our store, now is the time to save with a 15% discount as our holiday gift to you. You’ve bought gifts for everyone else for Christmas, haven’t you? So now it’s time to treat yourself and your home to something special for the new year! Perhaps you will choose a piece from the beautiful Hobbs Germany line, which upcycles authentic wine crates stamped by French Bordeaux wineries as drawers. I tell you more about the furniture in this video. Browse all the collection, including one-of-a-kind kitchen islands, coffee tables, end tables, wine cabinets, coolers and more, at our Hobbs Germany Bordeaux Collection page. The collection is currently available in limited quantities. We’re now accepting pre-sales of inventory arriving in early 2017! Shipping is always free on the the Hobbs Germany Bordeaux collection and everything in our store, as long as we are delivering to the continental USA, and some parts of Canada. 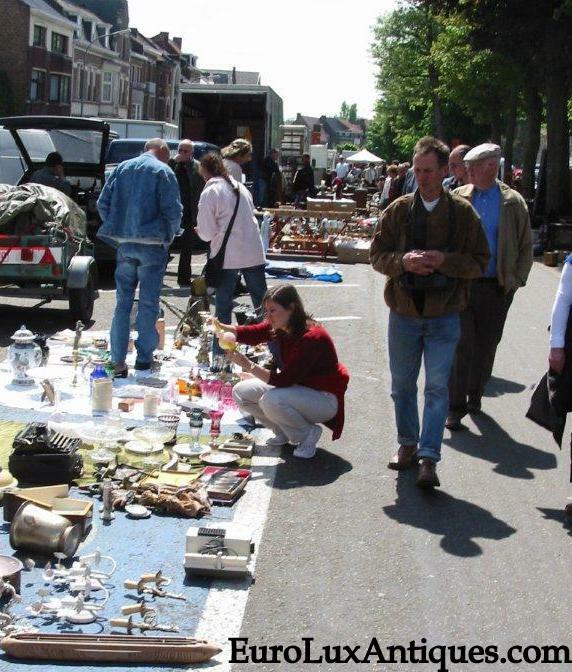 If you are looking for fine antique French furniture, then you also have plenty of opportunities to save! For example, save 15% on this antique French Renaissance buffet or server dating to the year 1900. Crafted in solid walnut with a gorgeous patina, this finely carved Renaissance style buffet includes fluted columns, and a carving of a Grecian style urn garlanded with flourishing florals. 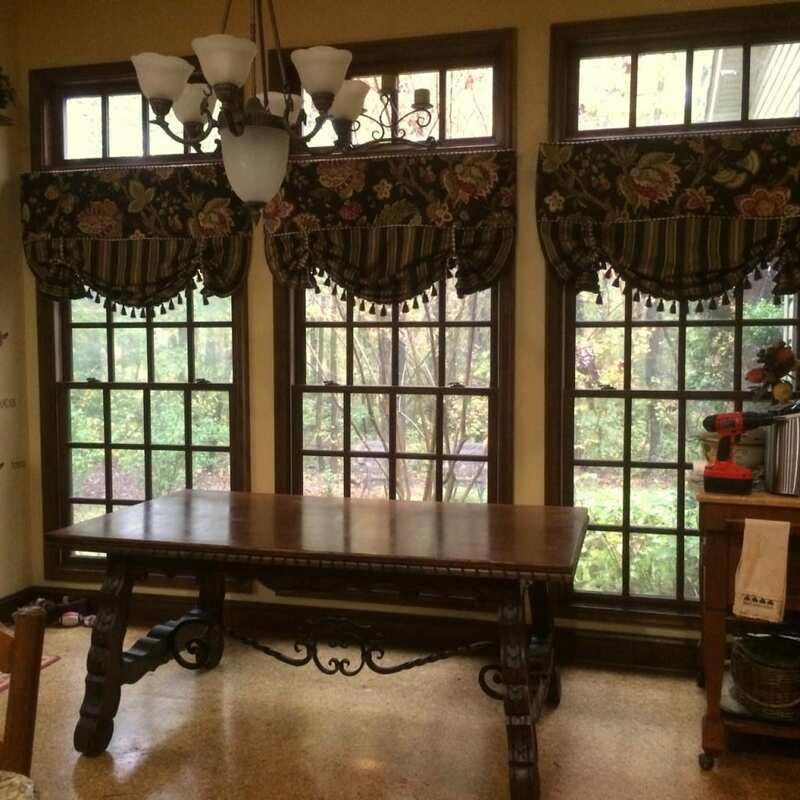 An open gallery offers plenty of space to display heirloom china or collectibles. You could serve a full meal to your guests from this antique French Renaissance style buffet, or use it as a splendid display case in your living area or hallway. Or perhaps you are looking for a stunning antique Chinese table like this late Qing Dynasty accent table or chest of drawers, dating to 1900. The table is elaborately carved in elm with hand-carved horses, symbolizing endurance and loyalty, deer for good fortune and bats for good luck. The 5-drawer antique Chinese table measures nearly 42 inches wide, making it a nice size for many uses from a hall table to a sofa table to a bedside table! If you’re feeling in the mood for new lighting to brighten up your dark winter nights, browse our vintage and new table lamps, chandeliers, and other lighting. 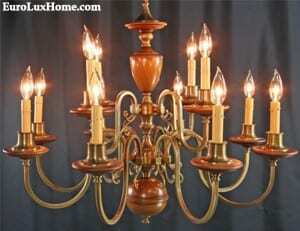 For example, this large vintage Flemish chandelier will add a warm glow to your living room or dining room or bedroom. The sculptural shape makes a dramatic statement in richly crafted wood and brass-tone metal. Measuring more than 31 inches wide, the classic vintage Belgian chandelier vase and ball design will suit any home. Smaller home decor items will also cheer up your new year, from hand-woven throw pillows to beautifully crafted candlesticks, boxes, and bookends. However you choose to use your 15% discount on antique furniture or vintage or new home decor, we wish you a very merry Christmas! This entry was posted in Holiday Fun, News and tagged antique french buffet, Antique Furniture, antique Renaissance buffet, antiques, Antiques Shopping, Chinese Antique Furniture, Christmas, coupon code, discount, Flemish Candelabra, French Antique Furniture, Hobbs Germany, holiday gifts, wine on December 20, 2016 by admin. Deborah and David first found us online, but were excited to discover that we’re only about an hour away from their home in Winnsboro, SC. Deborah is from the area and moved back home when her mother became ill a few years ago. She lovingly cared for her mother until she passed recently. We were so sorry to hear of her loss, but we understand that Deborah has now thrown herself into restoring their wonderful old home. David is also now retired and was busy at work on the back porch when we arrived to deliver the beautiful Renaissance buffet. 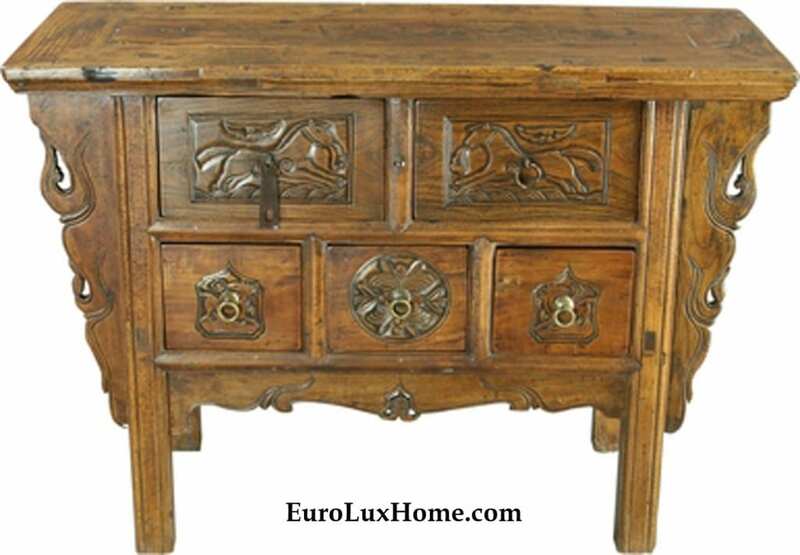 The oak Renaissance buffet dates to 1900 with carved fabric swags and florals on the upper cabinet doors. The lower doors of the antique Renaissance Henry II buffet hutch are equally well ornamented with diamond medallions surrounded by foliage. In addition to a spacious serving area, the buffet has a full-length plate rack and drawers for silverware. Deborah and David have already done a great amount of work on their home, including leveling the gorgeous original wood floors. Deborah thought the Renaissance buffet would look wonderful in the dining room and I have to agree! There was so much natural light streaming in through the big windows, that it is somewhat hard to see the color tones in the photos, but the buffet worked very well with the dining table and chairs and the corner cabinet. I loved the beautiful antique chandelier Deborah found to go over the dining room table! The entrance hallway of Deborah and David’s home features a large gilded chandelier that we found at an antique market in France. It is a perfect fit for the space and I love the decorative molding on the ceiling around the cap. The other antique pieces in the hallway and the vintage art on the walls make for such a warm, inviting space. Off to the right from the hallway, you can just make out a huge Champion gun safe in the corner of what is the billiards room. I didn’t snap a photo, but a beautiful antique pool table fills up the parlor! I understand David is quite the pool shark, so I didn’t wager a bet. The stairs at the back of the grand hall lead to the upstairs bedrooms. 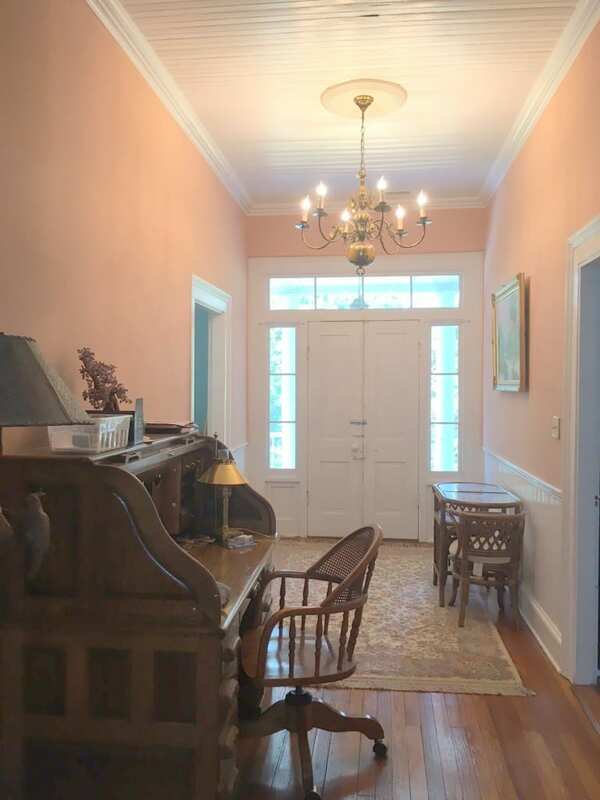 Deborah found a space for a Flemish chandelier from our collection for the upstairs hallway, which features a handsome roll-top antique desk and chair. Beyond the double doors is a wonderful second story porch – the perfect place to enjoy a mint julep and watch the fireflies! 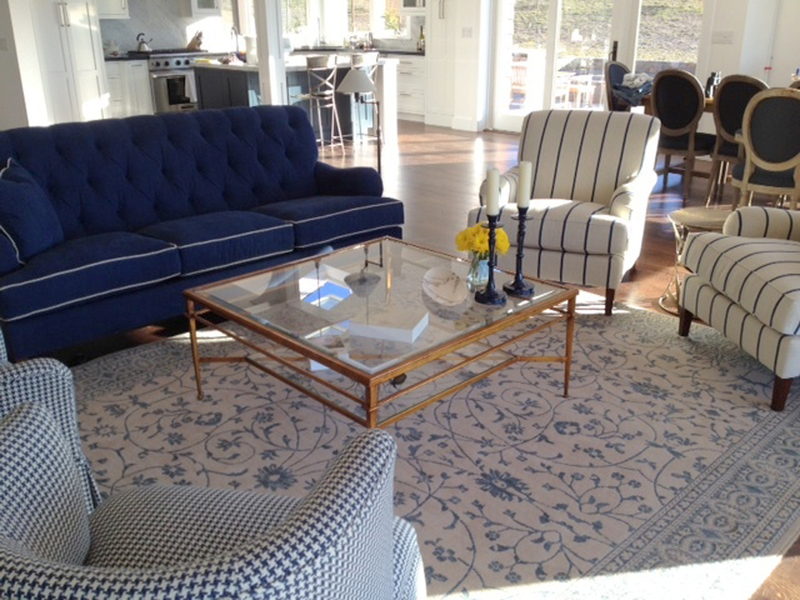 Thanks for sharing your beautiful home with us and our readers, Deborah and David! 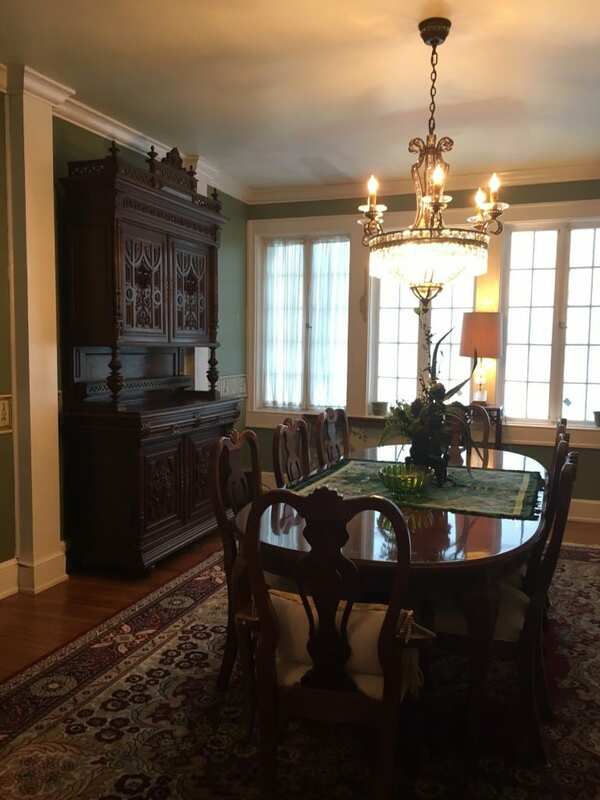 This entry was posted in Client Spotlight and tagged antique french buffet, antique French furniture, Antique French Renaissance Henry II Style Buffet, antique Renaissance buffet, Antique Renaissance furniture, dining room, Vintage Chandeliers on November 9, 2016 by admin. Antique furniture in the kitchen is not everyone’s first thought when they imagine how they might enjoy antiques in their home. But you’d be surprised! A few weeks ago when I was writing about the renovation of our 1920s vintage bungalow kitchen and then how my dream vintage kitchen worked out, I realized that antique furnishings in the kitchen is a big part of what makes the space feel so lived in, so comfortable, so inviting, and so uniquely personal. 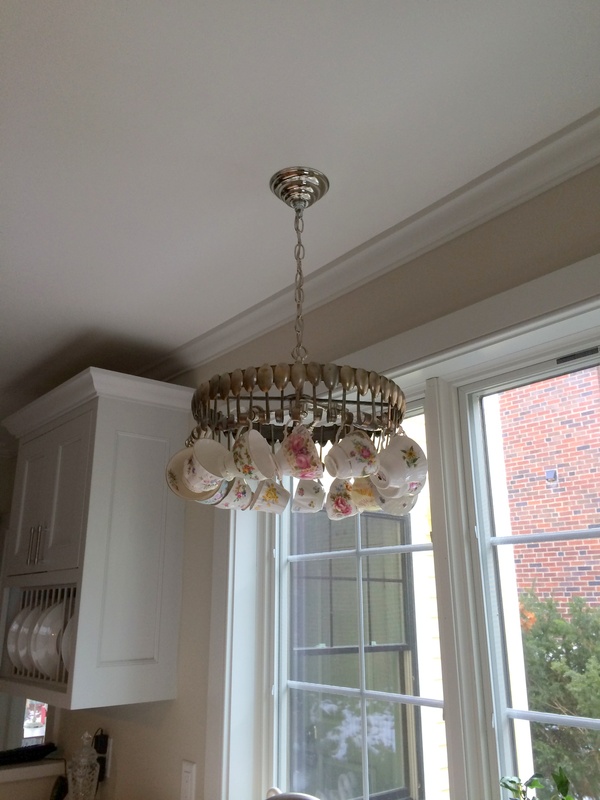 Let’s take a look at how some of our customers have used antique furniture in the kitchen. Natalya S. in Palo Alto, CA, bought this very pretty Henry II Renaissance style antique French buffet from us and it makes a wonderful statement in her kitchen. See the full story and more photos here. 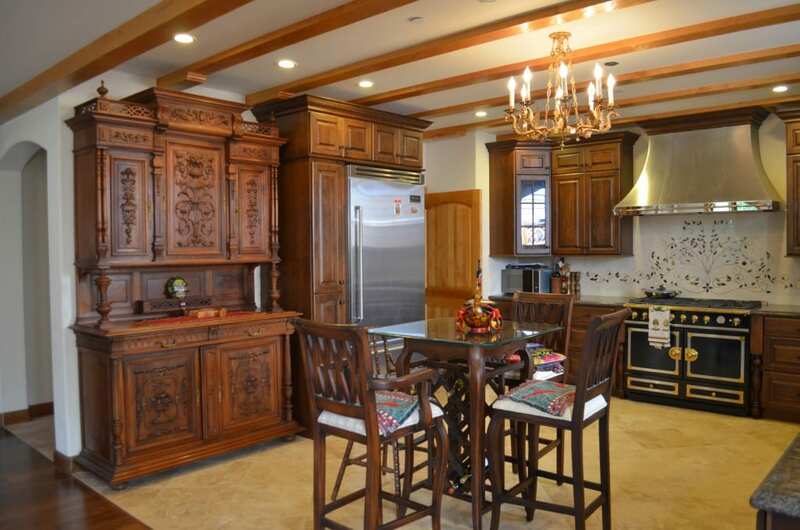 Elaborate walnut carvings add a decorative touch, along with leafy waterjet inlay design on the wall above the stove. The storage space in the big antique buffet makes it as practical for Natalya’s family as it is handsome. Our creative customer Kathleen G. in in Arcadia, OK, cleverly saw that this French antique nightstand in the Henry II style would work perfectly in her kitchen as a small table offering extra storage space. Dating to 1900, the antique nightstand has a gray marble top which is a good match for a kitchen, and it will keep the fruit platter cool too! 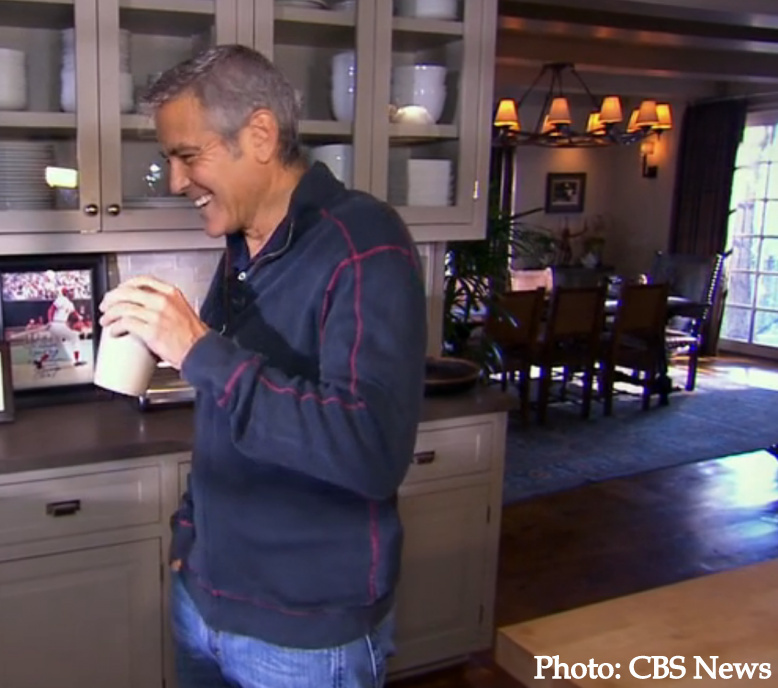 See more about Kathleen’s kitchen here. 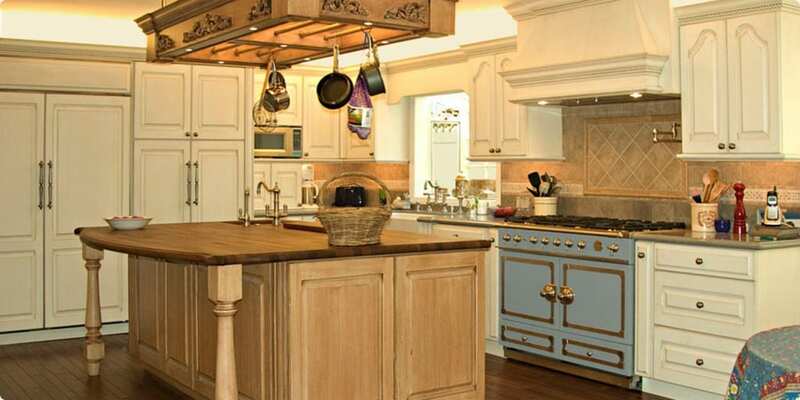 Our antique French Renaissance style furniture is clearly a popular choice for kitchens! 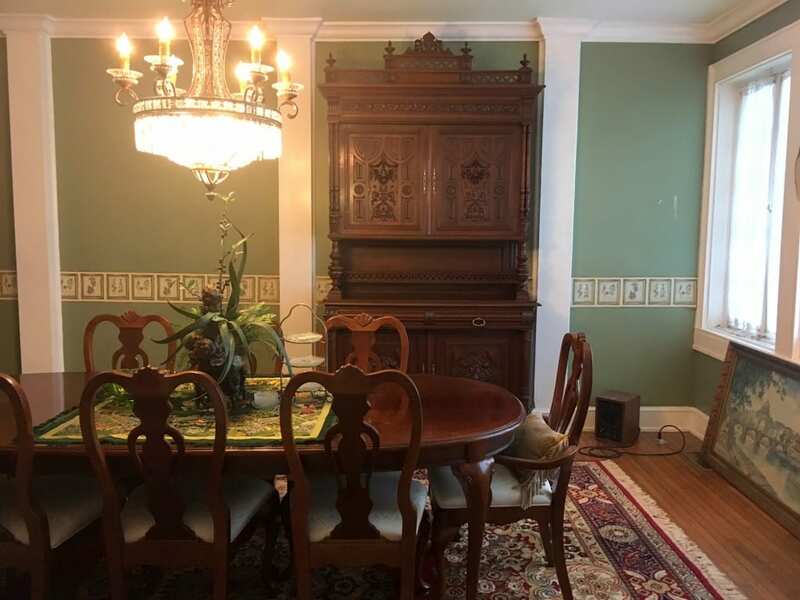 Crystal B. in Harlem, Georgia, hunted for the perfect table for her large, open kitchen for four years before she found this vintage Renaissance table of ours to buy! The sturdy table was crafted around 1950 with a beautiful golden parquet top and an ornate wrought iron stretcher that adds to the Renaissance feel. It’s the kind of welcoming kitchen table that invites everyone to gather around and chat. See more about Crystal’s Renaissance kitchen. This antique dresser or hutch once lived in Germany where it was a bookcase in a gentleman’s office. But doesn’t it look amazing in this otherwise very modern stainless steel kitchen? It shows that antique furniture can work in any style of kitchen decor. This kind of design imagination creates a completely unique space. 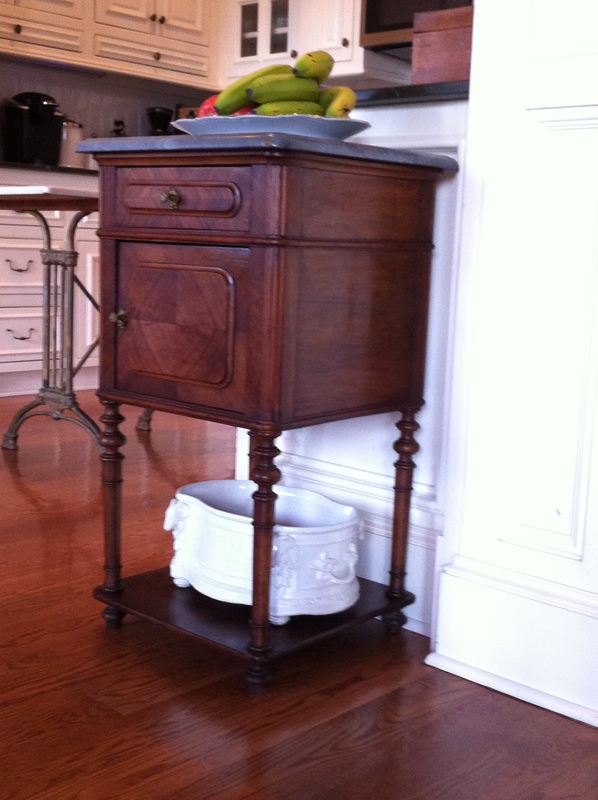 Another imaginative person repurposed an antique French sideboard into a kitchen island. I would hesitate to do this with some fine antique furniture, but it does look amazing! I hope this post has inspired you to think about how you could use antique furniture in your own kitchen! Or do you have some antique furniture, large or small, in your kitchen already? Tell us about it in the comments box – we’d love to hear! 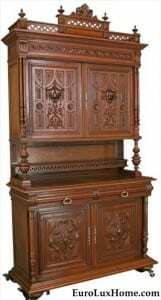 This entry was posted in Antique Furniture and tagged antique french buffet, Antique French Renaissance Henry II Style Buffet, Antique Furniture, antique Renaissance buffet, combining antiques and modern, French Antique Furniture, how to blend antiques into decor, kitchen, Renaissance table, Repurpose Antique Furniture, Repurpose Antiques on August 31, 2016 by admin. This is an unusual story about an antique French buffet with a carving inspired by a well-known French painting. Our customer Saul in Gurnee, IL, bought the antique Renaissance buffet from us last year while he and his wife were building a new home. Now they are settled in, Saul got in touch to purchase a bench from us and he also sent us a photo of the buffet in place. So let’s take a look! 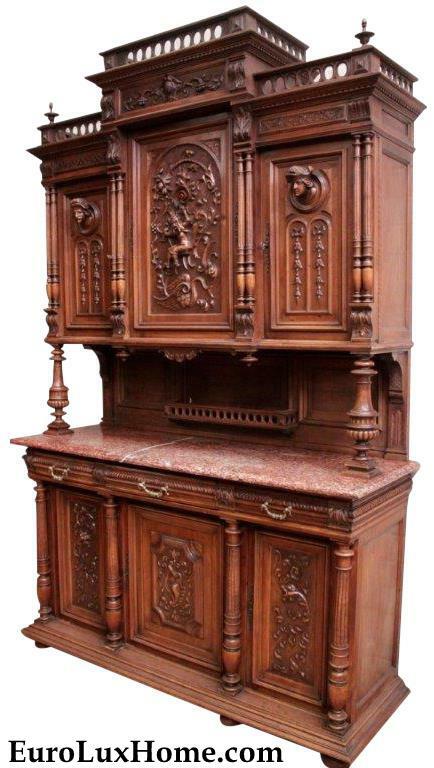 This is the gorgeous antique Renaissance buffet, fabulously carved in walnut and dating to about 1900. On the top center door, there is a carving of two lovers on a swing under a tree, based on the 1873 painting titled Le Printemps (Springtime) by Pierre-Auguste Cot. I first saw the buffet at an antiques market in France and I was wowed by the carving of the lovers, so we had it shipped home to the gallery. The patina of the walnut is very nice – it has a warm glow. The Renaissance Revival Henry II-style buffet is also carved with other Renaissance-style flourishes, fruit, and faces. The artist Pierre Auguste Cot lived from 1837 to 1883 and among his many prizes and medals he was made Chevalier of the Legion of Honour. Le Printemps was one of his two most famous paintings. It is now on display in New York City’s Metropolitan Museum of Art . And finally… here’s the buffet in Saul’s home. He says that he loves it! I noticed the nice table too with figure carvings on the legs. Saul told me it was an antique and be bought it because he liked it. I would guess that it may be French Renaissance dating to the turn of the century and I think it is also made in walnut, so it is the perfect complement to the buffet. Saul also just bought this handsome new bench or window seat from us. 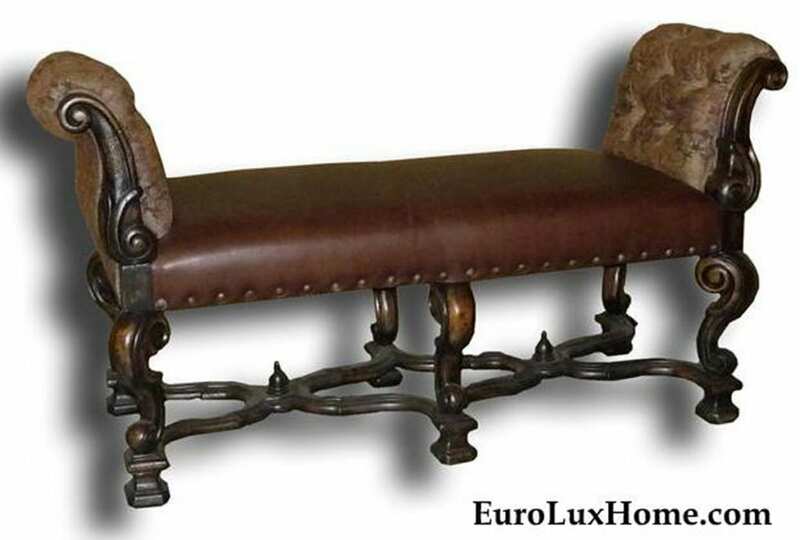 It’s a very good match for the antique Renaissance pieces he has, with the leather upholstery, nailhead trim, decorative stretcher and a blackwash finish. I hope we’ll get a photo of this piece in your lovely new home too, Saul! I can’t wait to see how you continue to curate the furnishings and other decor as you obviously have a very clear vision in mind and it all looks terrific so far! We’d love to hear readers’ comments about the carving of the painting. What do you think? Share your opinion in the comments. 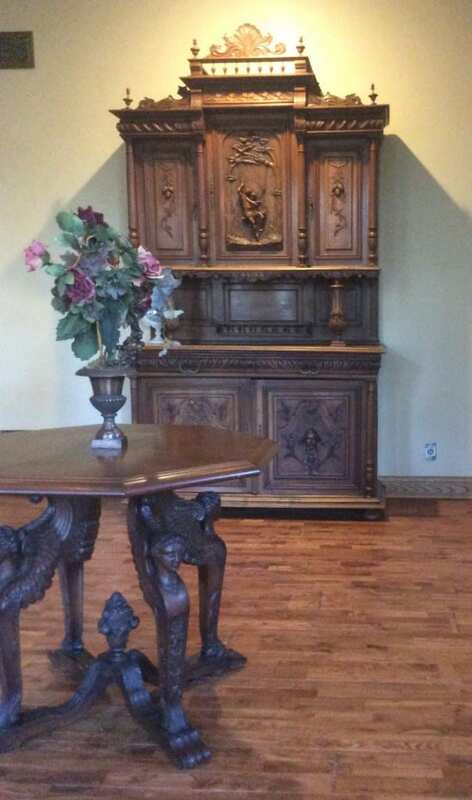 This entry was posted in Client Spotlight and tagged antique buffet, antique French furniture, Antique French Renaissance Henry II Style Buffet, Antique Furniture, antique Renaissance buffet, Antique Renaissance furniture, antique server, French Antique Furniture, Heavily Carved Antique Furniture, living with antiques, Renaissance table on December 18, 2015 by admin. Last year I wrote about Bob H. in Prairie Grove, Illinois, who bought a set of ten antique Renaissance chairs from us. We had a wonderful photo tour of his amazing French Renaissance chateau style home, inspired by European castles. Bob enjoys medieval and Renaissance armor and he also bought a marble-top French Renaissance buffet, carved with a knight on horseback. Bob was so inspired by the knight on horseback carving that he had artists create a mural based on the carving, and then a stained glass window too. Let’s start at the beginning! This is the antique Renaissance buffet Bob chose. Bob has been a pharmacist for 30 years, so he decorated the walnut wood buffet with a vintage Lladro Spanish porcelain figure of a pharmacist and antique mortars and pestles. 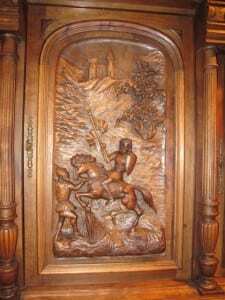 This close-up of the upper part of the buffet shows the Renaissance knight on the center door, riding his horse before the old castle. This is the image that inspired Bob to have a mural painted by an artist, for an alcove in an upstairs hallway. It’s so fantastic and such a great likeness to the carving! But Bob still wasn’t done. The Renaissance knight was called upon again to serve his lord and master, Sir Bob. 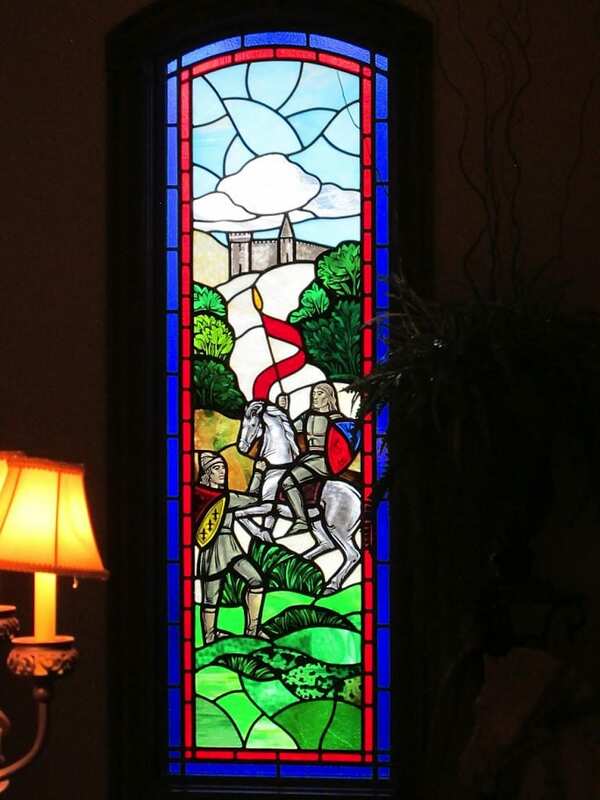 This time, the knight would ride across a stained glass window. 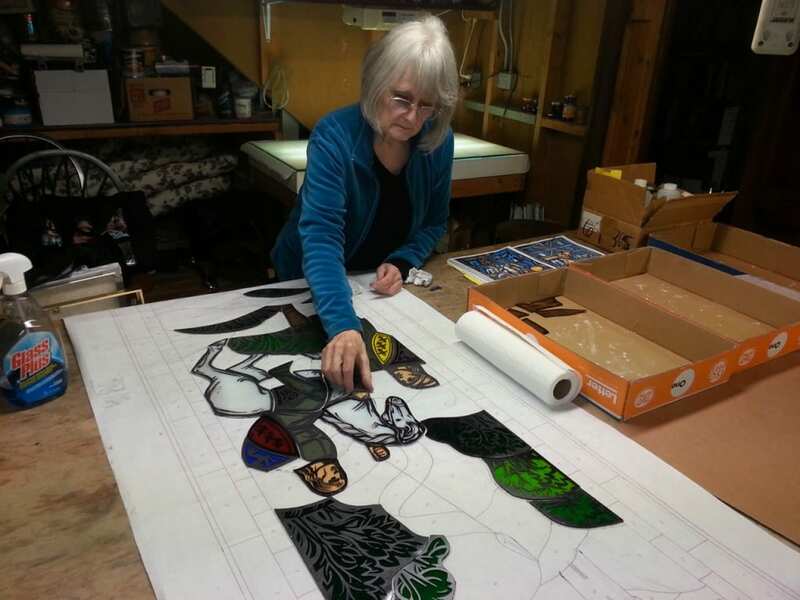 To keep you in suspense just a little longer, here’s the commissioned artist at work on the window. The stained glass window is beautiful and the colors so bright and pure. What a jewel! It’s big too, at six feet tall and 2 feet wide. The window is installed in the foyer above Bob’s front door entry. The suit of armor in the foyer is a nice early 20th century reproduction, but the rapier sword with the suit is an original from the 17th century. There are so many gorgeous details in this space, let’s take a look from some other angles. 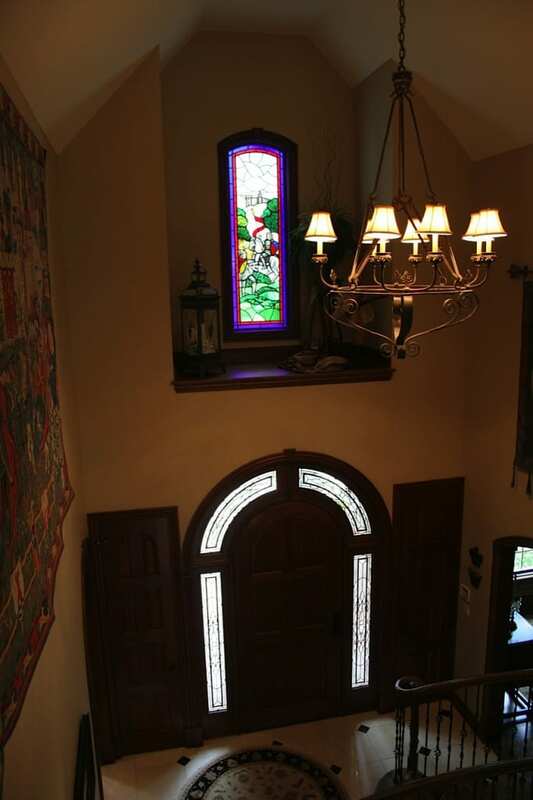 This is the view from the top of the stairs, with that chunky iron chandelier making the perfect accent to the window. 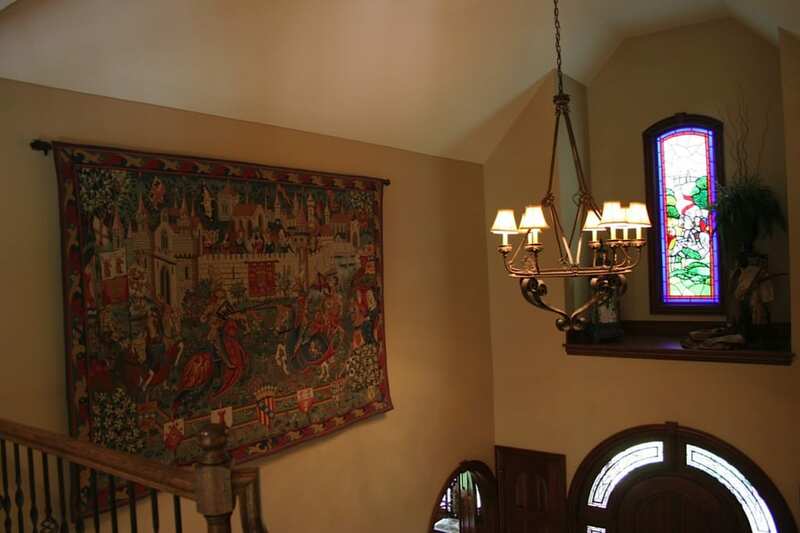 On the left wall of the foyer, a large tapestry or wall hanging adds another authentic touch to the medieval Renaissance style. I mentioned ten leather-upholstered antique Renaissance chairs dating to 1900 that Bob also bought from us. Here they are in his splendid kitchen paired with a custom table that Bob had made by Amish craftsmen to match the chairs. Bob is one of our visionary clients who has a great knack for creative décor and we so appreciate him keeping us posted of the knight’s latest journey. What’s next, Sir Bob? A stone-carved knight fountain, perhaps? We can’t wait to hear! Aimee owns EuroLuxHome.com with her husband and best friend, Greg. Aimee sources amazing antique furniture, vintage lighting, & high-quality reproduction furniture to help her customers decorate their homes in a unique way. 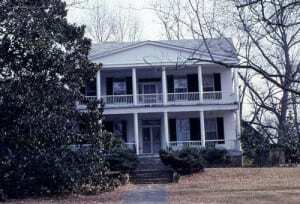 She loves her 8 (you read that right) fuzzy children and is renovating a 1920s bungalow in South Carolina. Find us on Facebook or connect with EuroLux on Google+. Or never miss a post if you sign up here to receive this blog in your inbox. 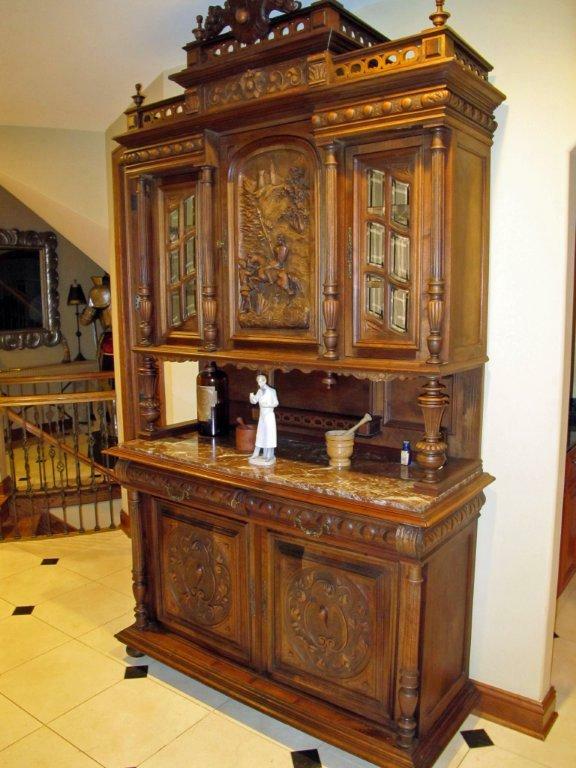 This entry was posted in Client Spotlight and tagged antique buffet, antique chairs, Antique French Renaissance Henry II Style Buffet, antique Renaissance buffet, French, French Renaissance Chairs, French Renaissance Sideboard, interior decor, living with antiques, medieval, mural, suit of armor on November 11, 2014 by admin. When Natalya S. emailed from Palo Alto, CA, about a very pretty antique Renaissance style buffet she bought from us, it had been quite a while since we’d been in touch. In fact, Natalya bought this antique buffet back in August 2011! So I was thrilled that she took the time to send a wonderful photo of it in her home. This is the sideboard or hutch. It’s a very high quality French antique Henry II Renaissance style buffet dating to 1900. Elaborately carved in walnut with flourishes and fruit, it has an especially nice grain pattern and patina. 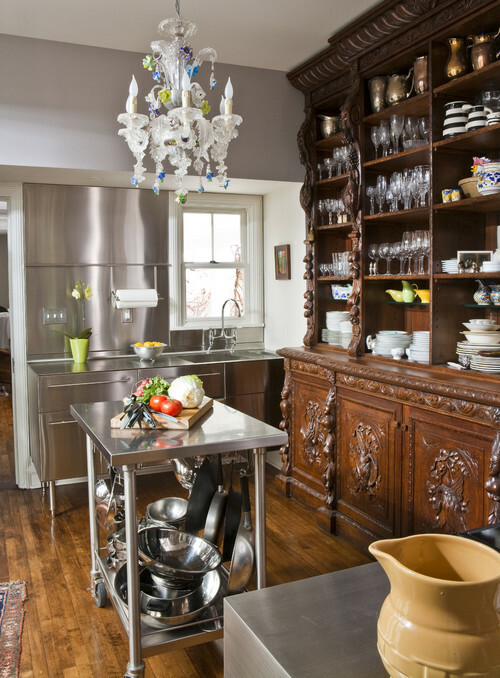 Here is the antique Renaissance style buffet looking fantastic in Natalya’s kitchen! I guess that with her three lively young sons running around, a big sturdy buffet is just what you need in the kitchen. This is one more than 8 feet high and about 5 feet wide, so it provides plenty of storage space as well as looking beautiful. 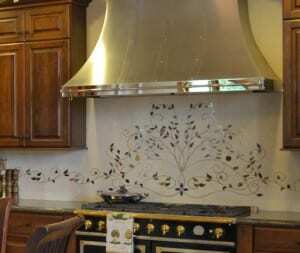 The leafy artwork on the wall above the stove is waterjet inlay made from marble, onyx, and some other stones. “You could probably find someone locally that may do the design that you like,” says Natalya. She suggests a company like this that does inlay marble collections. The stove itself is a CornuFé 110 from La Cornu and it is so gorgeous I browsed around the La Cornu website. The company is a family business like ours, and it was founded in Paris, France, in 1908. The CornuFé 110 that looks so chic in Natalya’s kitchen is also available in different colors. 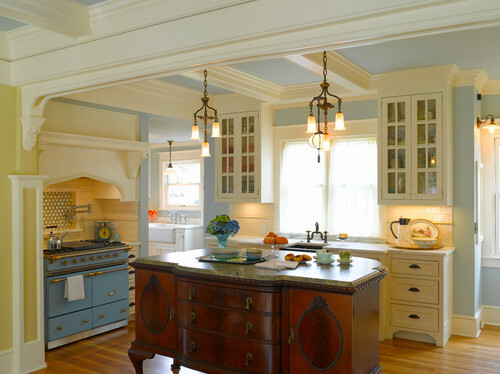 Here it is in a soft blue in another traditional style kitchen. Isn’t it grand? As regular readers of our antiques and décor blog know, we always love seeing photos of our customers’ homes for our series of Client Spotlights. No matter how many years have gone by, we are always delighted to hear from customers about how our furniture or home accents are fitting into their home and, we hope, enhancing their life. 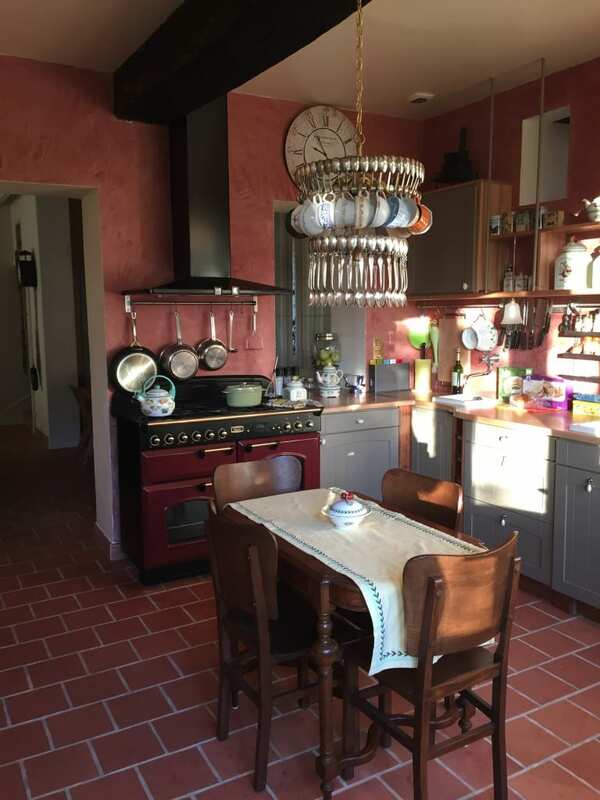 So thank you Natalya for sharing the photo of your beautiful and unique kitchen! Aimee owns EuroLuxHome.com with her husband and best friend, Greg. Aimee sources amazing antique furniture, vintage lighting, & high-quality reproduction furniture to help her customers decorate their homes in a unique way. 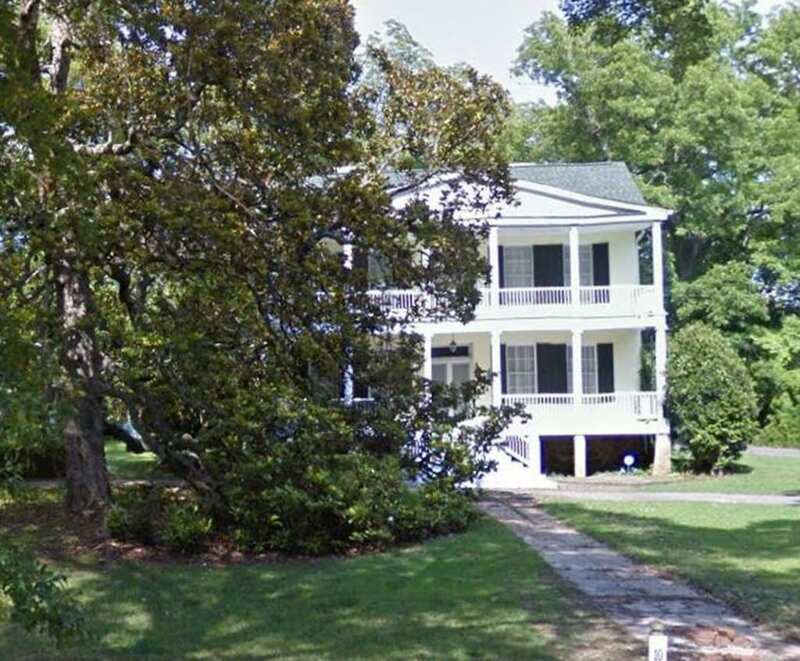 She loves her 8 (you read that right) fuzzy children and is renovating a 1920s bungalow in South Carolina. Find us on Facebook or connect with Aimee on Google+ Or you can sign up here to receive this blog in your inbox. 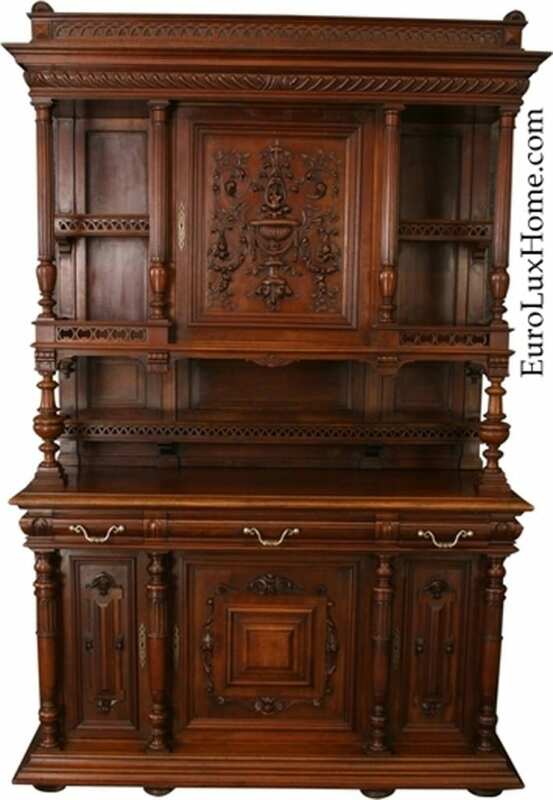 This entry was posted in Antique Furniture, Client Spotlight and tagged antique french buffet, antique French furniture, antique Renaissance buffet, Antique Renaissance furniture, antique server, Antique Sideboards, French Renaissance Sideboard, Heavily Carved Antique Furniture, interior decor, kitchen on September 20, 2014 by admin. 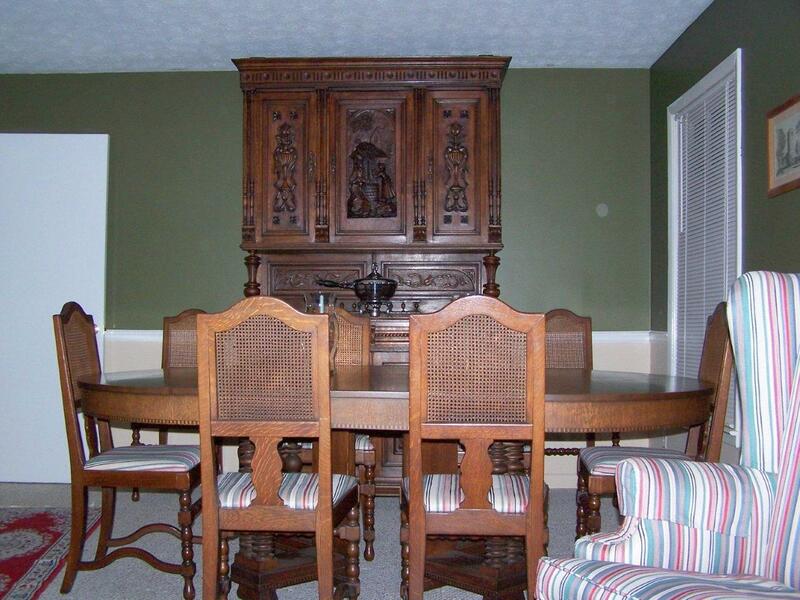 I just came across these photos from a client who bought an antique Renaissance style buffet. As it is the 10th anniversary of EuroLux Antiques this year, I’ve been digging through quite a lot of old files, and I realized I’ve never shared these photos with you. Tracy R. from Oxford, Alabama, bought this antique Renaissance style buffet some years ago. He came to pick up the oak buffet from us in the gallery, then he kindly sent these photos. 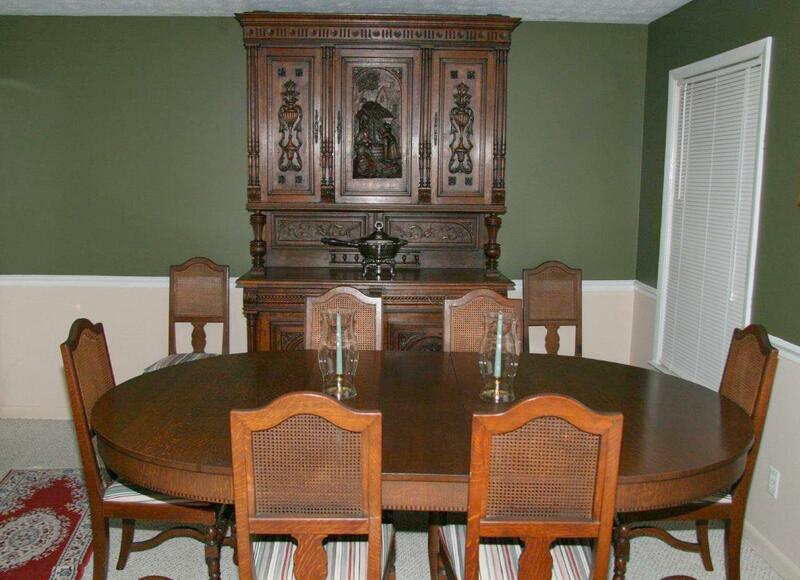 The antique Renaissance style buffet dating to 1900 looks wonderful in Tracy’s dining room. It looks so elegant against his dark green walls with the oval table and handsome dining chairs. Two glass candle holders on the table add an authentic finishing touch. 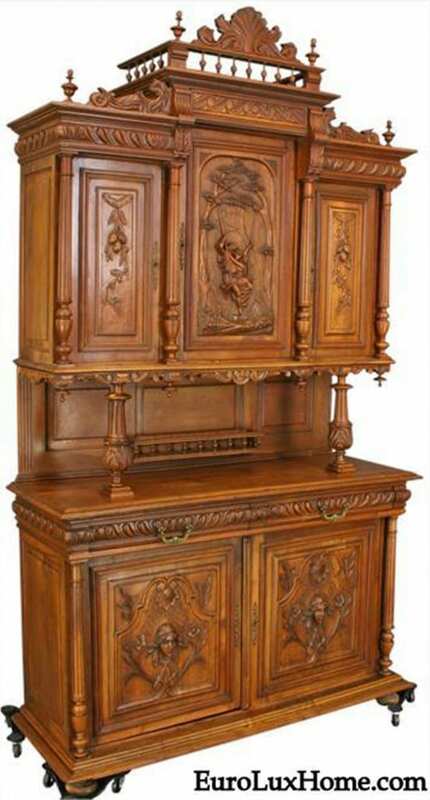 The buffet or server is typical of antique Renaissance style furniture, featuring beautiful carvings on the doors and on the posts that support the upper part of the hutch. This second photo zooms out a little so you can see how the arm chair is upholstered in the same striped fabric as the dining chairs. That upholstery stripe is charming – classic but adding a great pop of color! We carry a lot of antique Renaissance style furniture in the gallery, as well as some finely crafted reproductions. Typical pieces include buffets, chairs, tables, and chandeliers – so the style is especially popular for dining rooms. It creates a rather stately atmosphere for a dinner party! The Renaissance Revival style flourished in Europe from the 1830s to the end of the 19th century. At this time, furniture makers and craftsmen drew on classic Renaissance style that originated in Florence, Italy, in the 15th century. They reinterpreted the style with their own creativity, but still the furniture showed the trademark antique Renaissance style details. The heavily-carved furniture tended towards large proportions and ornate carvings of classical motifs. Designs included scrollwork, arabesques, garlands of flowers and fruit, pediments, and columns. References to Greek and Roman mythology might include faces and cherubs. This large antique Renaissance style buffet currently in our gallery is a fine example. Crafted in France in around 1900 in highly grained oak, the carved buffet is adorned with diamond medallions and foliage on the lower doors. The upper cabinet doors are carved with fabric swags and florals. At nearly nine feet high and six feet wide, the antique Renaissance Henry II buffet hutch is topped by a decorative crown. It offers plenty of serving and storage space and also has a full-length plate rack and two drawers for silverware. Pretty splendid, huh? You can see more about this style, including photos of clients’ homes, in my other blog posts about antique Renaissance style furniture and decor. Or just browse the posts on antique Renaissance buffets. This entry was posted in Client Spotlight, Learn History & Styles and tagged antique buffet, antique french buffet, antique French furniture, Antique French Renaissance Henry II Style Buffet, antique Renaissance buffet, Antique Renaissance furniture, dining room, home decor, interior decor on February 20, 2014 by admin. Greg and I always enjoy seeing how creative our clients are in decorating their homes. Many go beyond simply furnishing their space. They expand on a theme they love to the point where they are living inside an era – inside a historic story really! Our client Bob H. recently told us about his Renaissance mural, which is a great example of such unique interior design. A few months ago I blogged about the Renaissance chairs and Renaissance buffet that Bob bought from us. 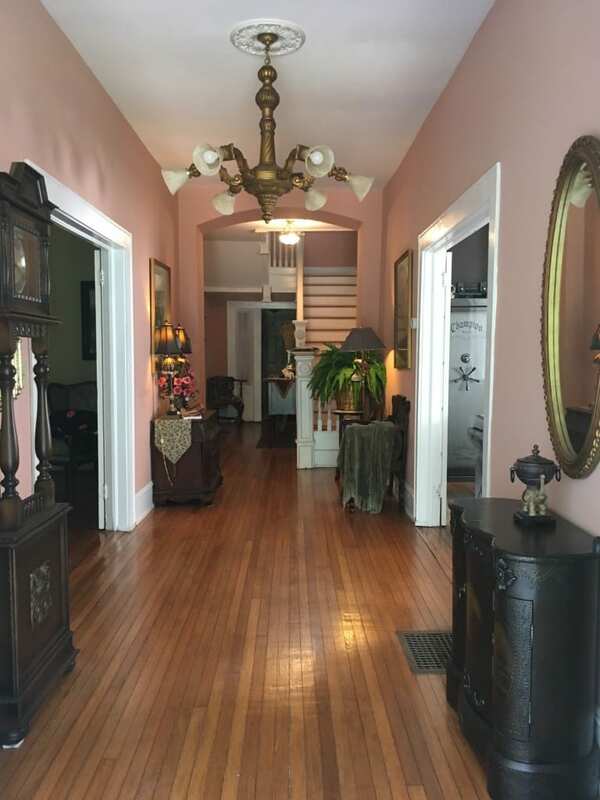 Bob lives in a beautiful French Renaissance chateau style home in Prairie Grove, Illinois. 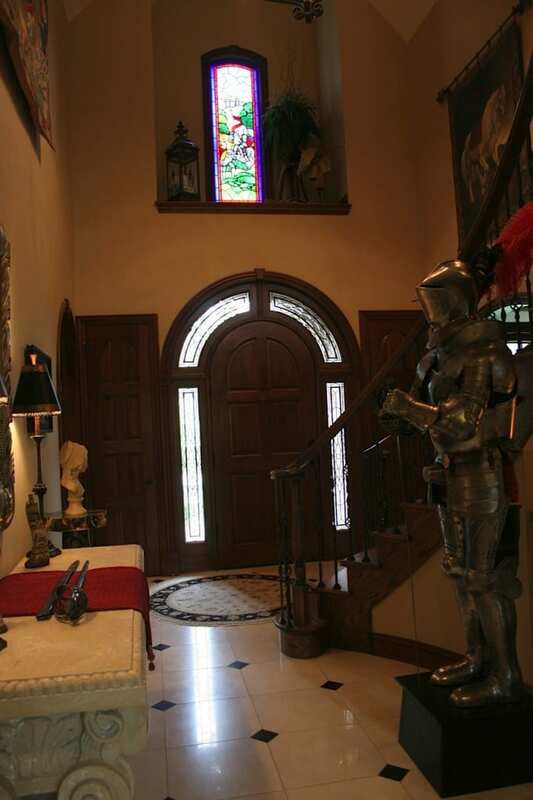 His home is inspired by European castles and he loves medieval armor. The carved knight on horseback on the marble-top 1900 French Renaissance buffet was a perfect match for his interests. This is a close-up of the buffet in Bob’s home. He decorated it with antique apothecary items as he has been a pharmacist for 30 years. You can see the valiant knight riding his horse before the old castle on the center door. We were amazed and delighted when Bob told us he’d had an artist create a mural based on the knight carvings. Isn’t it wonderful? When Bob sent the photo of the Renaissance mural in an art niche or alcove, he said it was still not quite finished. We think it’s impressive enough already! We bet that the French artist who carved the original knight on the buffet would be thrilled to know that more than 100 years later his craftsmanship would continue to inspire a home-owner and a 21st century artist! 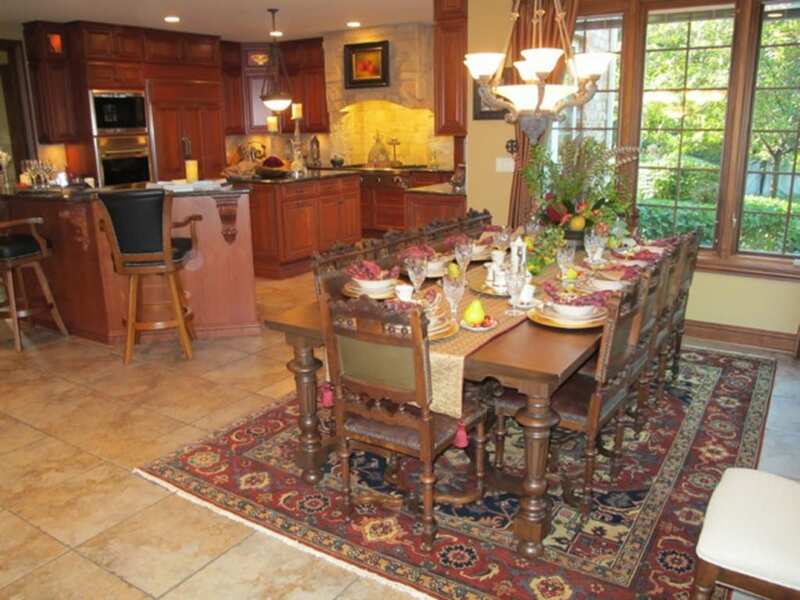 You can see more photos of Bob’s chateau home in our client spotlight. The dramatic house was featured in Crystal Lake’s 39th Annual Housewalk this year, and when you check out the blog post you’ll see why. Bob’s creative approach reminded me of another client we featured a while ago on this blog. Hans J. in Cambridge, MA, purchased this charming vintage Flemish candelabra from EuroLuxAntiques.com for his Dutch room. Like Bob, Hans fully enters into the spirit of the antique treasures he loves. Hans created an entire room designed to evoke the feeling of a Dutch interior around 1690 during the Golden Age of Northern Baroque art. His interest in creating this lavish 17th century Dutch style interior is partly inspired by the fact that his mother was born in Delft, Holland. Also, Hans’ family owned an antique shop, so he grew up with European antiques. My previous Dutch Baroque room blog post shows more photos from Hans of his amazing decor and the vintage candelabra he bought from us in its new home. If the Renaissance mural and Dutch Baroque room inspire you with your home decor, or if you’ve already created a themed room like these, we’d love to hear about it in the comments box below! This entry was posted in Antique Furniture, Client Spotlight and tagged antique Renaissance buffet, Dutch Interiors, interior decor, interior design, living with antiques, Vintage Candelabra, Vintage Lighting on December 24, 2013 by admin.